Norway is a once-in-a-lifetime destination . The essence of its appeal is simple: this country is not pretty in bits and pieces rather it is a place where you will refuse to close your eyes even for a second to avoid missing on spectacular scenery . Before visiting Norway I had 3 preconceived notions about the country : One that it was expensive. Two , it was going to be tough to get good vegetarian food . And third all people would be Viking-like (from dress up to way of life).In next 8 days I found out that only one of those notions were true. Can you guess?? (Leave your guess in the comments below — and check back on my next post on Norway to see if you were right! J ) . Norway does not do nature in small scale – period . It is like a cobweb of Fjords and land that makes everything so scenic and peaceful that you would want to stay there forever. I will definitely cover all tips , tricks , itinerary details , things to do , best scenic drives in my upcoming blog posts. 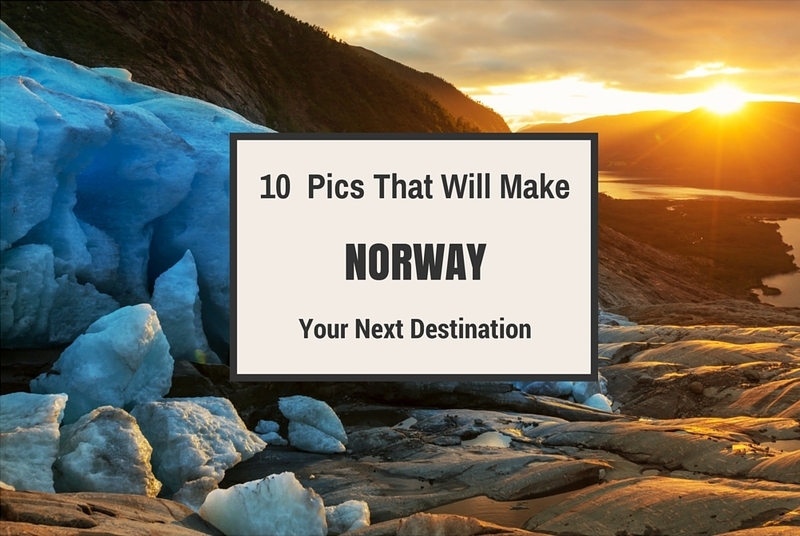 But first here are 10 pictures that will make Norway your next destination. So Shall we start?? 1) The land of Fjords, as truly named is utterly unforgettable. 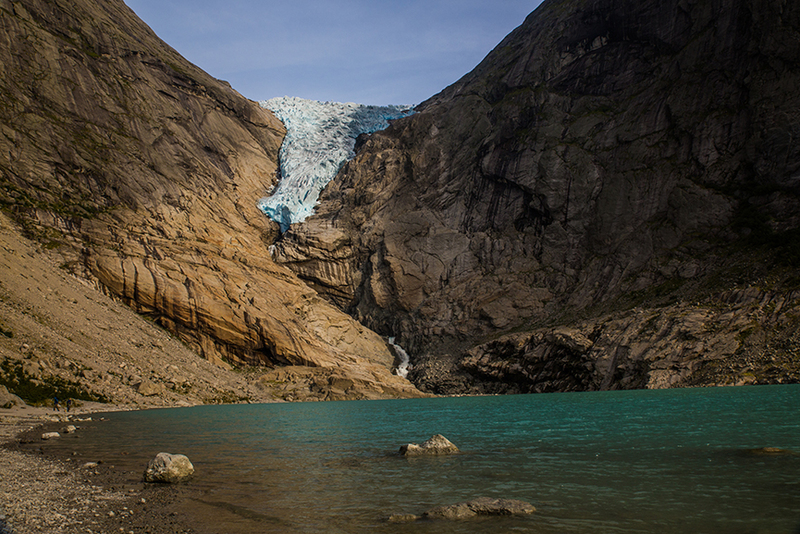 What makes these fjords unforgettable ?? – Waterfalls pouring down the mountainsides, lush green pastures and lovely small villages lined along the fjords – And did I mention you can enjoy all this by taking a cruise. 2) Its not only Fjords that take your breath way . 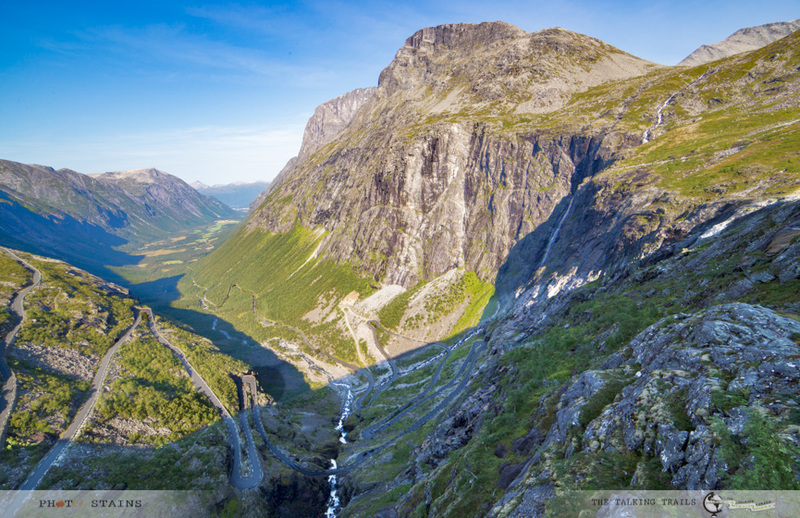 With a slope of up to 12 % , the serpentine like Trollstigen road with eleven hairpin bends will make your blood freeze if you’re not terribly fond of heights. Can you count all 11 bends in the picture below ? 3) If height scares you , then tranquil waters with perfect reflections will definitely calm you down. 4) With the steepest train lines in the world, snowcapped mountains surrounding the valley and gushing waterfalls this is the must do experience of Norway. 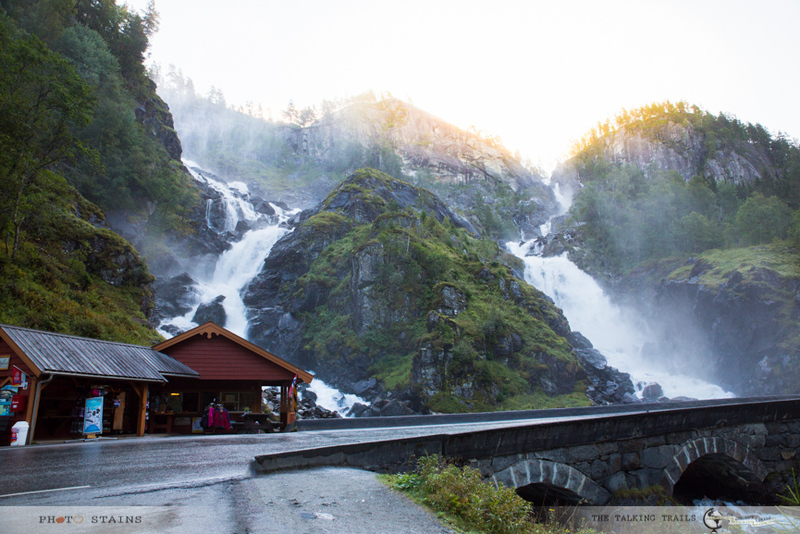 Kjosfossen Waterfall on the flam railway is one of the many waterfalls en-route this line. If you are lucky enough, you can get a glimpse of red fairy performing a mythical Huldra in Summer. 5) The beauty of the coastal towns of Norway is unbeatable . View of Alesund from top of Mount Aksla will leave you spellbound. 6) When in Norway , keep your camera ready . You never know when you will get to see perfect sunset. 7) 165 mts high , the twin falls known as Latefossen make for a spectacular view as one drives over old , stone , six-arched bridge on RV- 13. 8) Sognefjell National Route , the most scenic byway is the highest and most dangerous mountain road in Northern Europe . A drive through this road , you will never forget in your life. 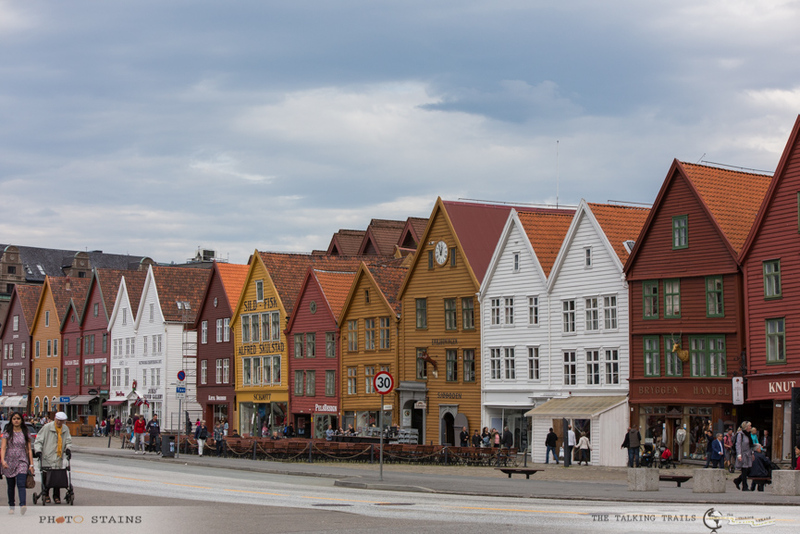 9) One of the most popular tourist’s attraction , Bryggen is a UNESCO world heritage site famous for its restaurants, artists’ studios, craftsmen’s workshops and small boutiques. Every year Bryggen attracts more than a million visitors. 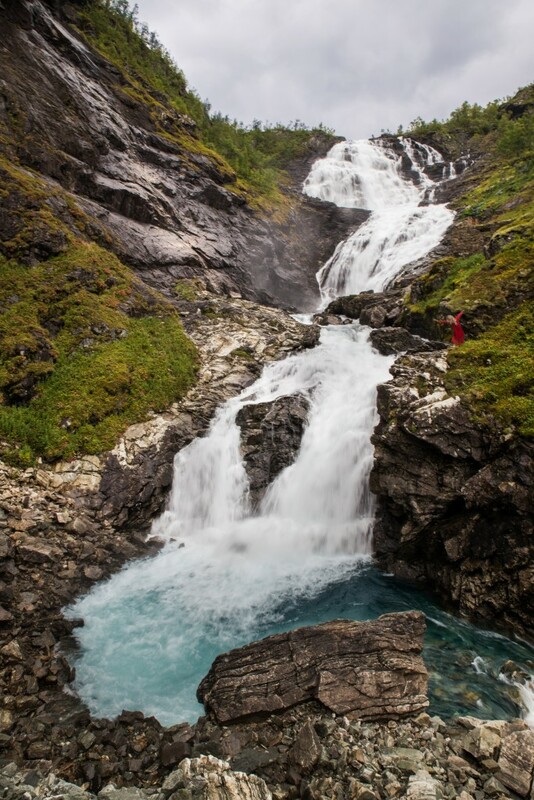 10) A walk to Briksdal glacier takes you through roaring waterfalls and high peaks. There was a time when you could actually walk on Briksdal Glacier. The receding glacier does tell that global warming is not a myth. I hope my this blog post helps in breaking the dilemma of “Should I” or “Should’d I” go to Norway. Which picture did you find the most fascinating ? A place as spectacular as Norway surely deserves at-least a visit. Stay tuned for best scenic drives, itinerary recommendations , things to do and money saving tips for Norway in my upcoming blog posts. If you have any question or if you are planning a a trip to Norway and need to ask anything , please leave me a comment below and I will happy to help. Thank you so much for stopping by and following me on my journey to Norway. My guess is that the only pre concieved notion which proved true was that it was expensive. Only thing which is holding me back! You are so right It did dig a big hole in our budget. Gas was very expensive. I’m a huge Disney fanatic, so I would love to see the country that gave Disney the idea for Frozen! 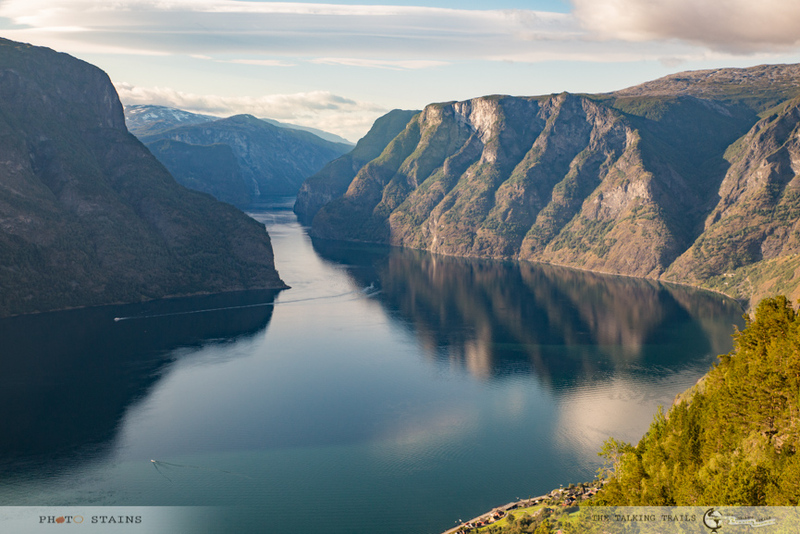 Those fjords are absolutely breathtaking and I can’t even imagine somewhere with that much beauty! Hopefully we’ll make it there someday! You have to plan a trip there , it is just amazing. I myself plan to go to North side of Norway next year specially Tromso. Norway is so big that it was impossible to cover it all in one trip. We have visited Oslo this year and it was really expensive, but we love it so much that are planning a second trip!! We would love to visit the Lofoten Islands as well as taking the train and seeing the Fjords. Looking at your pictures, I get the idea that it would be a great holiday. It will be indeed. I myself plan to visit Lofoten sometime soon. Could not see it all .. Norway has way too much to see. Wow! You’re right, these photos do make me want to go to Norway right now. Like Megan, I’ve always thought Norway was too expensive to visit, though I do have some old travel friends there who would put me up. Did you take most of these from the air? The shots of the Alesund village and Trollstigen Road are particularly spectacular. If you have friends there , nothing like that seriously. We had friends there too and it was awesome to live with Norwegian family and to know more about their culture and way of life. First of all, beautiful photos! I would go there in a blink of an eye if it was not that cold. I mean, anything lower than 25C is cold ;). However, the country is so magnificent that I might summon all my courage and just go there one summer. As per guessing about your reservations, I would say that been expensive proved to be true. Cheers! Thank you so much Elena and you are right , it was expensive. We went to Norway in September and we were lucky that it did not rain and it was pleasant. but locals did tell us that best time to go to Norway is June – July. You did a very good job of describing Norway! We have been there twice, and when you said “you will want to live there forever”, you were so right!! Any time I see pictures from Norway, I think of our super wonderful experiences and want to go back SO badly, but that word ‘expensive’ gets in the way. I tell people frequently that I’d love to live in Norway!! I so agree with you .. I myself will definitely want to live there. it is indeed happiest country in the world. No words to describe this place. Unimaginable beauty. Hi Kanika, I must admire your Travelogues. I wish could have read your blog before doing so much of research !! 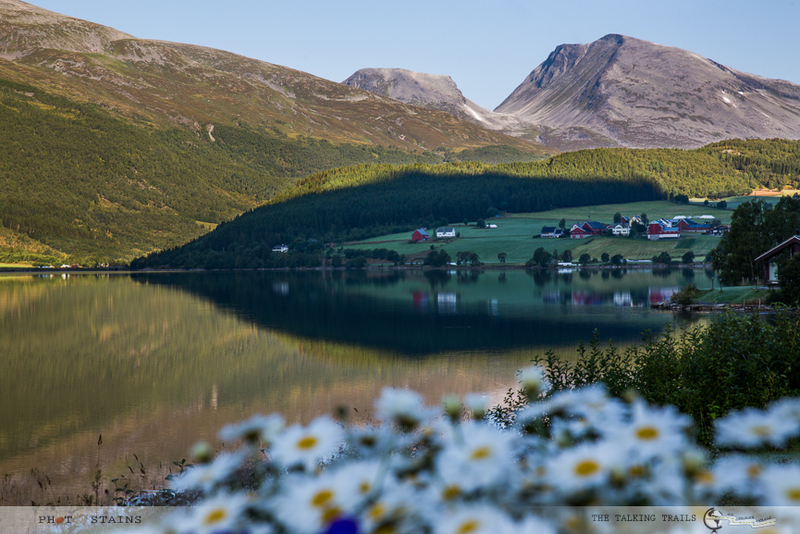 I am planning a trip with my wife in Jube to cover Norway & Iceland in one go …. 1. I have less time so can you please suggest me one must do self drive road trip in Norway. 3. Where was 3rd picture clicked ? Please convey my compliment to your husband for the beautiful shots. From my experience I will suggest pick one country of the two if your reservations have not been made already. You will find a lot of similarity in the landscape of two countries. The best drive I found for Norway and which is almost must do is one between Geiranger Fjord and Trolltunga. Trolltunga is very nice and the entire drive around it is very scenic. 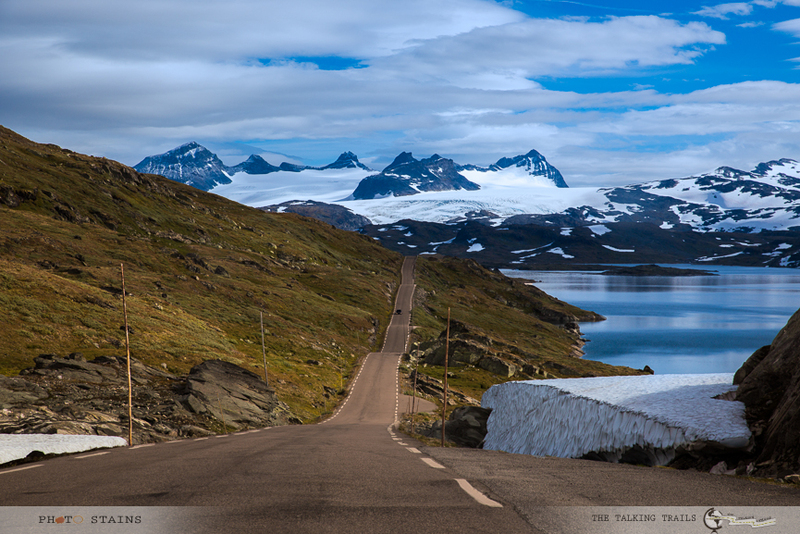 The third picture you are referring to is Trolltunga ( zig zag roads). I will advise to skip Oslo. Do not spend much time there as its like any other big city. if you have limited time , you can either drive or take a train from Oslo to Bergen and enjoy the scenery around. You can skip Flam train as well since you have limited time and the whole Flam experience takes more than half day for sure. I cannot live without Indian food so Maharaja restaurant in Bergen was a big relief. Meal for 2 costed us around 45-50$ I guess. There are some other recommendations in my blog ” Bergen – A complete travel guide” as well for vegetarian food in Bergen. I have passed on your compliments to Manhar and yes you made his day .. THank you my love. love your travel posts. Friday night -Mon morning in Oslo ~ then plan to make our way to Bergen (by train or car?) any suggestions? After Bergen is where we get confused… “Norway in a Nutshell” day trip? Two-day trip with an overnight? We are 4 siblings from 50- 66 years of age (relatively fit and very curious and jubilant!) We will also have two other adults and a 20-s0mething nephew along to keep us hip…! Any suggestions for after Bergen? Love your photos and your attitude! So great to hear that you are planning your trip to Norway. There is absolutely nothing in that country that you will not like … SO you are landing in Oslo , I will say skimp the town and head directly to your next destination. I can tell you how we did it. We took the car and drove to Odda via Hardengervidda National Park. The drive is amazing. You can return car in Bergen so that you do not have to go all the way to Oslo to return the car. Or You can take the train to Bergen , rent a car there , roam around and return it in Bergen itself and fly out from there. Either way , you must have the car in order to enjoy. I have given my original itinerary here : http://thetalkingtrails.com/2016/01/27/8-day-itinerary-for-norway-2/ . Have a look. 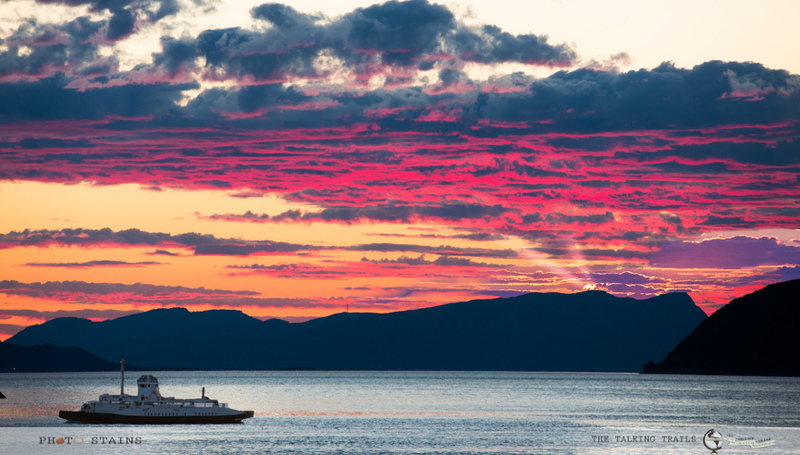 If you follow my itinerary – ferry ride is included as a way of transportation. You will be crossing so many Fjords between two points that you will have to take ferry and that is as good as taking actual ferry ride in a fjord. Are you guys interested in hiking etc. ?? If you want to talk to me , let me know I can definetly help you in tailoring my itinerary to suit your needs ( Don’t worry it will cost you nothing ) . I just want my fellow travelers to have an excellent experience.